So, I'm just going to jump right into it. 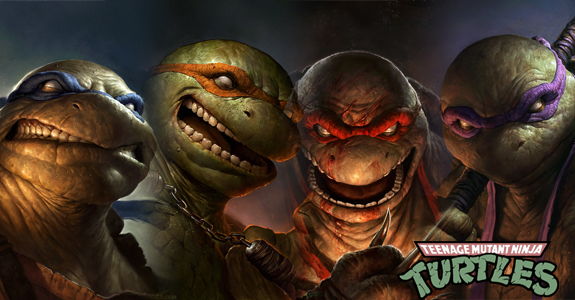 There are heavy rumors that Rocksteady, the team behind Batman Arkham Asylum/City are hard at work on a Teenage Mutant Ninja Turtle's game akin to that of Arkham City. If true. I'm going to be immensely happy. Their Batman titles blew me the hell away and to think that the same amount of love and dedication could be put into a TMNT game... gahh. I'm at a lost for words. As a youngin' I grew up on a few solid franchise. That being Batman (the animated series mostly) TMNT (both the cartoon and the movies) and GhostBusters (again Movies and cartoons) and thus they all have a huge place in my geeky heart. We got a fairly decent Ghostbusters game in 2009 and Batman has had 2 amazing titles swoop into gamers hearts... I would love if TMNT were to follow. Please, please, please let this be real... and not just a bogus rumor. PLEASE!